Contemporary American conservatism – a mélange of ideas, people, and organizations – is difficult to define; even conservatives themselves are unable to agree about its essential meaning. Yet the conservative movement is well financed, exerts strong influence in the Republican Party, inspires followers throughout the land, and has spawned a network of think tanks and media outlets that are the envy of its competitors. It is a powerful political force with which to be reckoned. This book examines how that has come about and what contemporary conservatism signifies for US politics and policy. It looks at the recent history of conservatism in America as well as its antecedents in the UK, traces changes over time using American National Election Study data from 1972 to the present in what it means when people say they are conservatives, and assesses the prospects for American conservatism, both in the near term electoral context and over the longer term as well. 2. Is the United States a Conservative Nation? 3. Who are the Conservatives? 6. How Different are Political Elites and the Public? 7. What is the Meaning of Contemporary Movements like the Tea Party? Joel D. Aberbach is Distinguished Professor of Political Science and Public Policy, and Director of the Center for American Politics and Public Policy, at the University of California, Los Angeles. Joel Aberbach has added measurably to his reputation as a highly-regarded political scientist with his brilliant new book on American political conservatism. Focusing on the vigorous and highly ideological Reaganism that has been in force over the last few decades, this illuminating book provides some clues to the sources of this brand of American conservatism. Aberbach also traces American conservatism from the early 20th Century to the mid-century moderate conservatism of President Dwight Eisenhower to the more muscular conservatism of Senator Barry Goldwater, and on to the form of conservatism that was introduced with Ronald Reagan’s election in 1981 and modified under George H.W. Bush, George W. Bush, and by Congress members and presidential hopefuls during the Obama years. American conservatism today is a blend of philosophical positions and economic, political, and cultural beliefs and policy preferences that are viewed as conservative because they are promoted by groups that identify as conservative. Its arguments and ideas fuel the perceptions and intentions of Republicans, and distinguish conservatism from current American liberalism. This book methodically elaborates the issue stands of American conservatism and the ever-greater issue cleavages that distinguish it from American progressivism and the politics of Democrats. Almost 70 years ago, American political scientists called for more ideological coherence in the nation’s parties. Aberbach does us all a service by identifying the issue divisions that have developed as a consequence of realizing this academic wish. 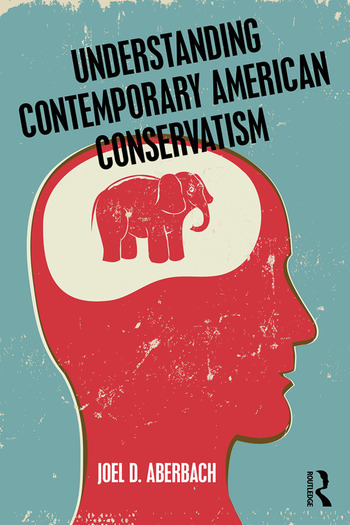 Understanding Contemporary American Conservatism is a tour de force of ideological and behavioral change among the American public – particularly on the conservative side of the political spectrum – by one of America’s foremost political scientists. Aberbach’s clear prose and straightforward analytics produce a compelling story line about the relationship between political ideology, party identification, and voting behavior across four decades. But more than just a focus on changing individual level relationships, Aberbach examines how institutions incentivize or discourage extremist ideological positions. Among other things, he notes the differences in conservatism in Britain and the US, and the varieties of conservatism that exist in the US. This is, simply put, a superb book for documenting and understanding the polarizing politics that has been with us for a while and which seems to be growing stronger.